Carrot websites include SSL with every site! 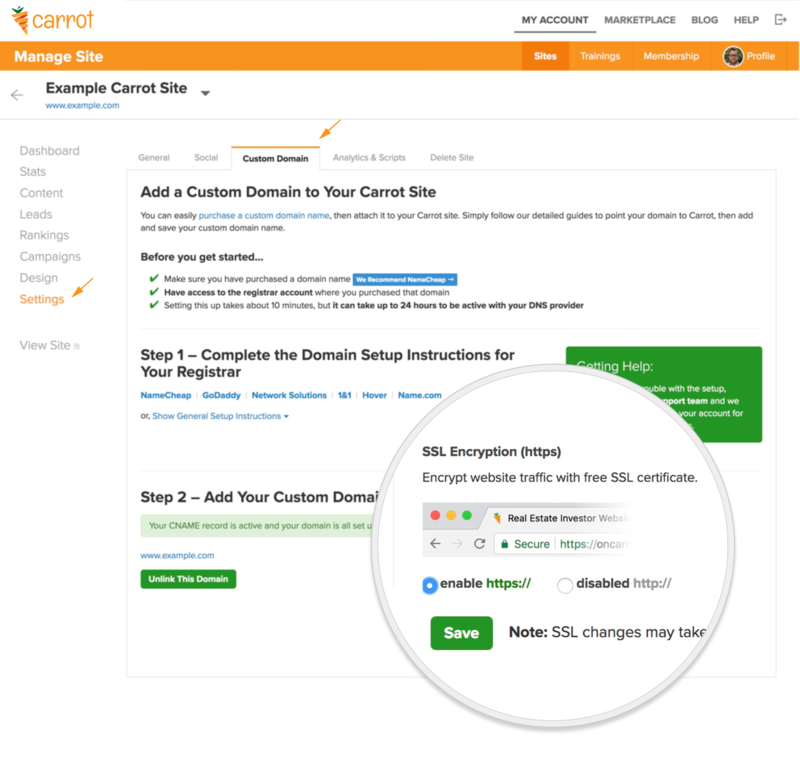 Carrot makes secure SSL connections for your site visitors instant, reliable, and included with your membership. Once you have completed your custom domain setup for your Carrot site, your SSL certificate will be automatically created and applied. None of the typical purchasing and renewing a certificate each year with your registrar is required! If you have any questions or need any help attaching your custom domain to your Carrot site, our team is here to help as always! Note: Have an existing site from before SSL support? If your existing site from 2017 or older is not yet using https://, you can easily turn it on in your domain settings. Just click enable, save the change and your site will be transitioned to SSL shortly! There are lots of discussions and questions around whether SSL impacts SEO rankings of your website. In short, it can. The long answer is it’s complicated and there are many factors in play that depend on your situation. Does Google look for SSL in SEO rankings? – Google has reported many times recently that they *may* look at SSL in rankings as a minor factor. But as of the time of this writing SSL is such a minor SEO ranking factor that we don’t see a negative impact in rankings by not having SSL on your website. Google has said they are likely to make it a more important ranking factor as time goes on, so this could be an opportunity to get ahead of the curve. My Rankings Dropped After I Added SSL. Is This Normal? – Often times if you have an established website with a solid ranking it can be normal for a temporary rankings drop to happen. Every significant change to a website causes Google to re-look at things and a URL change (which adding SSL is a URL change) is a decently major change. During this time Google will often times soften the rankings. This could last just days but could last longer as well. But the long-term benefits of SSL often times override the negatives of a short-term rankings drop. At some point Google will require all sites to be SSL so it’s either adding it now or adding it later. How Does SSL Impact My Backlinks? – When you build backlinks to your website you always want to use the default version of your URL. You can find this default version by just pulling up your website, and copying and pasting the actual FULL URL (including the http: or https:). Sometimes 10% of your link juice may be lost from your backlinks that were your non-ssl version (http: vs. https:). This could impact your rankings if Google has you “on the bubble” on a ranking or if your backlink profile is weak. Just continue to build new backlinks with your full default url including the “https:” and see if you can update your existing links to be your full “https:” url. Google Console Shows A Big Drop In Views – When you change your URL to be “https” it’ll impact your Google Console reports unless you update your Google Console URL for your site to be the full “https” url. Google recognizes “http:” and “https:” as different URLs so you must update the URL in Google Console and other reporting services. Do I Need To Add SSL Right Now For SEO? – The short answer is, as of the time of this writing (early 2018) the answer is NO. Right now Google doesn’t look at SSL as a major ranking factor. If you’re nervous about your SEO rankings dropping you can always opt to not add SSL right now. Eventually we feel Google will make SSL a more major factor both with Google Chrome security alerts to browers and in Google search rankings.